This IBM® Redbooks® publication demonstrates and documents how to implement and manage an IBM PowerLinux™ cluster for big data focusing on hardware management, operating systems provisioning, application provisioning, cluster readiness check, hardware, operating system, IBM InfoSphere® BigInsights™, IBM Platform Symphony®, IBM Spectrum™ Scale (formerly IBM GPFS™), applications monitoring, and performance tuning. This publication shows that IBM PowerLinux clustering solutions (hardware and software) deliver significant value to clients that need cost-effective, highly scalable, and robust solutions for big data and analytics workloads. 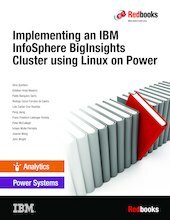 This book documents and addresses topics on how to use IBM Platform Cluster Manager to manage PowerLinux BigData data clusters through IBM InfoSphere BigInsights, Spectrum Scale, and Platform Symphony. This book documents how to set up and manage a big data cluster on PowerLinux servers to customize application and programming solutions, and to tune applications to use IBM hardware architectures. This document uses the architectural technologies and the software solutions that are available from IBM to help solve challenging technical and business problems. This book is targeted at technical professionals (consultants, technical support staff, IT Architects, and IT Specialists) that are responsible for delivering cost-effective Linux on IBM Power Systems™ solutions that help uncover insights among client's data so they can act to optimize business results, product development, and scientific discoveries.